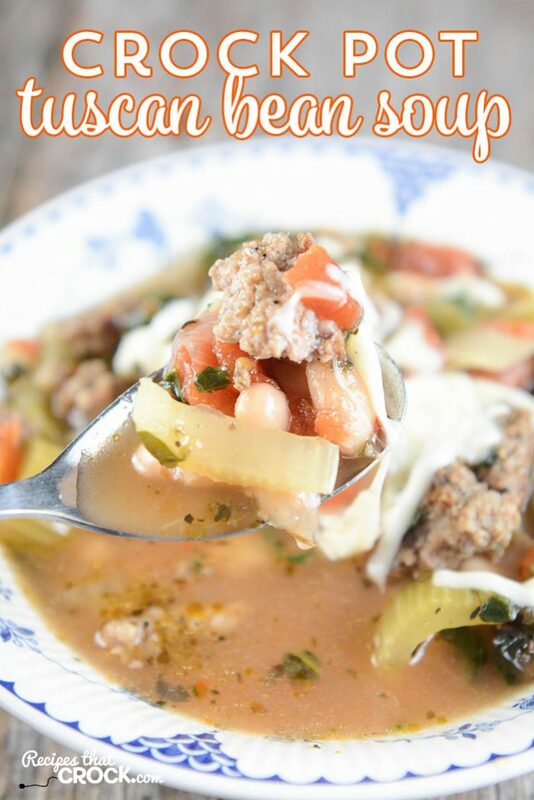 Crock Pot Tuscan Bean Soup - Recipes That Crock! Crock Pot Tuscan Bean Soup is a flavorful Italian-inspired recipe that is perfect for the slow cooker whether it is for family dinner or a potluck. Cris here. I have a new soup I am absolutely in LOVE with! This Crock Pot Tuscan Bean Soup is altered from a recipe in Gooseberry Patch’s Fresh and Easy Family Meals and we love it so much we make up big batches and freeze them for lunches at this house (We used these containers to freeze all our soups). Mikey whipped you up a video for it too! 1 lb sausage browned and drained. This Crock Pot Tuscan Bean Soup is altered from a recipe in Gooseberry Patch’s Fresh and Easy Family Meals. We like to use our browning slow cookers for this recipe since you need to brown your sausage before slow cooking. We’ve used both our Cuisinart 6 Qt 3 in 1 Slow Cooker and our new West Bend 84966 Versatility Oval-Shaped 6-Quart Programmable Slow Cooker (Here is a page of all our slow cookers.) Any 5 to 6 qt slow cooker should work just fine. We used Great Northern Beans but Navy Beans would work just fine. 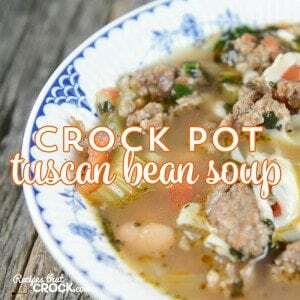 Crock Pot Tuscan Bean Soup is a flavorful Italian inspired recipe that is perfect for the slow cooker whether it is for family dinner or a potluck. This Crock Pot Tuscan Bean Soup is altered from a recipe in Gooseberry Patch's Fresh and Easy Family Meals. We like to use our browning slow cookers for this recipe since you need to brown your sausage before slow cooking. We've used both our Cuisinart 6 Qt 3 in 1 Slow Cooker and our new West Bend 84966 Versatility Oval-Shaped 6-Quart Programmable Slow Cooker (Here is a page of all our slow cookers.) Any 5 to 6 qt slow cooker should work just fine.